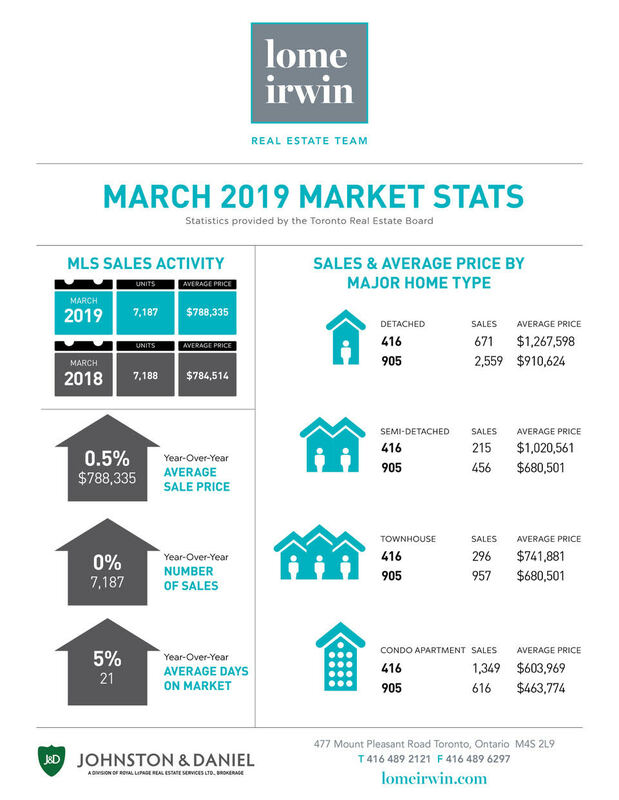 TORONTO, ONTARIO, April 3, 2019 – Toronto Real Estate Board President Garry Bhaura announced that Greater Toronto Area REALTORS® reported 7,187 residential sales through TREB’s MLS® System in March 2019. This result was inline with 7,188 sales reported in March 2018. For the first quarter of 2019, sales were down by one per cent compared to Q1 2018. While March and Q1 sales remained relatively flat compared to last year, new listings have declined more so than sales. March new listings were down by 5.1 per cent year-over-year and Q1 new listings were down by 1.5 per cent. “The OSFI stress test continues to impact home buyers’ ability to qualify for a mortgage. TREB is still arguing that the stress test provisions and mortgage lending guidelines generally, including allowable amortization periods for insured mortgages, should be reviewed. The supply of listings in the GTA also remains a problem. Bringing a greater diversity of ownership and rental housing online, including ‘missing middle’ home types, should be a priority of all levels of government. TREB is happy to be taking part in the City of Toronto’s consultations for the Housing TO – 2020-2030 Action Plan, and will certainly be raising the supply issue during these discussions,” said Mr. Bhaura. “While the City of Toronto’s recently announced Housing TO – 2020-2030 Action Plan is exciting and commendable and TREB looks forward to contributing solutions as a Member of the External Advisory Committee, the recently proposed increase to the Municipal Land Transfer Tax on higher priced properties is problematic. As the recent City budget process showed, the MLTT is not a sustainable revenue source from which to fund municipal programs. On top of this, additional MLTT on higher priced homes could have a trickle-down effect on the supply of homes throughout the housing price continuum,” said TREB CEO John Di Michele. The MLS® Home Price Index Composite Benchmark was up by 2.6 per cent year-over-year in March, while the average price for March sales was up by a lesser annual rate of 0.5 per cent to $788,335. The average selling price for Q1 2019 was up by 1.1 per cent year-over-year. “Market conditions have remained tight enough to support a moderate pace of price growth. Despite sales being markedly lower than the record levels of 2016 and early 2017, the supply of listings has also receded. This means that in many neighbourhoods throughout the GTA, we continue to see competition between buyers for available listings, which provides a level of support for home prices,” said Jason Mercer, TREB’s Chief Market Analyst.